MATTHEW 10:22 KJV "And ye shall be hated of all [men] for my name's sake: but he that endureth to the end shall be saved." 19But when they deliver you up, take no thought how or what ye shall speak: for it shall be given you in that same hour what ye shall speak. 20For it is not ye that speak, but the Spirit of your Father which speaketh in you. 21And the brother shall deliver up the brother to death, and the father the child: and the children shall rise up against their parents, and cause them to be put to death. 22And ye shall be hated of all men for my name's sake: but he that endureth to the end shall be saved. 23But when they persecute you in this city, flee ye into another: for verily I say unto you, Ye shall not have gone over the cities of Israel, till the Son of man be come. 24The disciple is not above his master, nor the servant above his lord. 25It is enough for the disciple that he be as his master, and the servant as his lord. If they have called the master of the house Beelzebub, how much more shall they call them of his household? And yee shall be hated of all men for my Names sake: but he that endureth to the end, shalbe saued. And ye shall be hated of all men for my name's sake: but he that endureth to the end, the same shall be saved. And you will be hated by all men because of my name: but he who is strong to the end will have salvation. 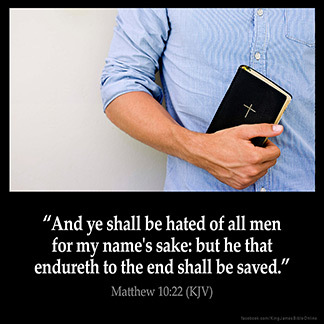 And ye will be hated by all men for my name's sake: but he that endureth to the end shall be saved. And you will be objects of universal hatred because you are called by my name; but he who holds out to the End--he will be saved. And ye schulen be in hate to alle men for my name; but he that shall dwelle stille in to the ende, shal be saaf. 10:22 Of all men - That know not God. #Mt 24:13|. Mt 10:22 Ye shall be hated of all [men]. As they assailed and sought to destroy all evil, and evil is wont to unite against them. Jews and pagans made a common cause against early Christianity. The wicked and perverse hate it still. He that endureth to the end. Holds out faithful. Perseverance gives proof of genuine faith, and is sure of reward.